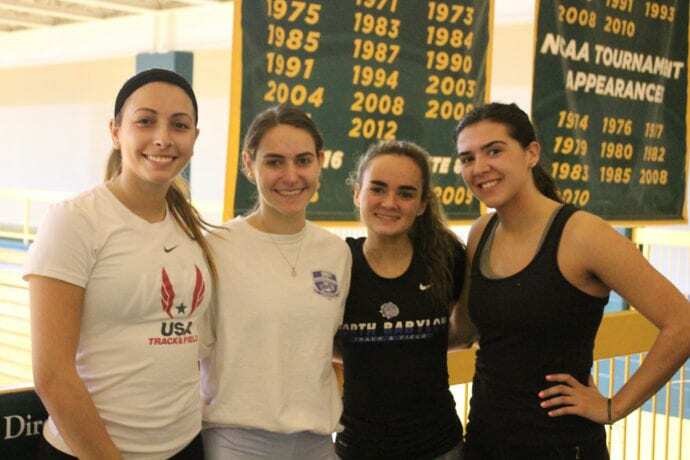 With the East Coast Conference Championships coming up next, the LIU Post men’s and women’s indoor track teams gathered for a workout at the Pratt Recreational Center’s indoor track on campus. With a smaller roster than last year but a lot of dedication, the athletes expect to perform at their best. Last year, the women’s team ended up in third place and the men’s team in fourth place. A lot has changed since then. 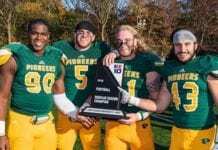 The announcement of the merger between the LIU Post and the LIU Brooklyn athletic teams led to some athletes deciding not to run this year. The roster has shrunk, mainly on the men’s team. Last year they had 25 active athletes. This year they have 11 to 12 boys who are active, according to head coach Kevin Buckley. “On the men’s side, we have lost kids. We got a couple of kids injured, some transferred and some just didn’t come back from last year,” Buckley said. The turbulence caused by the athletic merger has been a challenge for the athletes, but Buckley, who is head coach for both the men’s and the women’s team, is pleasantly surprised with how his athletes have handled the situation. “The kids who are here, they really hung in,” he said. Buckley is particularly delighted with the women’s team. “The women’s team gets a grade of A for keeping their focus, practicing, going through everything and succeeding when the vast majority won’t be running next year,” he said. The reason why many of the athletes won’t run next year is because of the merger. The indoor track teams will be located on the Brooklyn campus, which creates problems for Post athletes. Not all majors are offered at both campuses, which will prohibit a move for athletes who want to continue with their major. Buckley also explained that they have a very established Division I team at Brooklyn and a majority of his athletes will not be offered a spot on that team. Despite the changes, Buckley has high hopes for the upcoming championship and expects a lot of personal records. “Everyone should have their best times,” he said. He also hopes to get some of his runners qualified for the IC4A/ECAC Championships in March, where the runners will compete against a majority of Division I runners. “We are looking to be as good as we can. Even though we are a little bit out of business, we will keep on going and keep on trying,” Buckley said. One of the strongest athletes who will compete at the ECC Championships is sophomore marketing major Destyn Harding. Coach Buckley describes him as “the hardest worker you can possibly want.” He runs the 60-meter dash, 200-meter dash and the 4×400-meter relay. At last year’s ECC’s, Harding finished second in the 60-meter dash and fifth in the 200-meter dash. This year he has his mind set on the gold. “I expect to win the 60 and to be top five in the 200,” Harding said. Coach Buckley has high hopes for Harding, especially in the 60-meter dash. “He is a definite threat,” he said. Moving forward, Harding recently qualified for the IC4A Championships. Another potential scorer is senior political science major Kaitie Schillaci. “She is back in form again. She was a bit out of form, but she is running very well now,” Buckley said. Schillaci runs both indoor and outdoor track and needed some time to adjust to the faster indoor tracks. “Getting indoors is always a little bit harder because you are coming from cross country where it’s all outside and long distance. It’s a transition and you got to wake your legs up,” she said. Schillaci agrees that she did not perform as well as she hoped in the beginning of the season, but said that she is stronger now and more confident. Her goal for the weekend is to beat her personal record. “I ran at 3:09 last weekend and that is my personal record so if I can run at 3:05 or 3:06 maybe that would be nice,” she said. When it comes to the team, she hopes they can place themselves among the top three teams. In addition to Harding and Schillaci, junior Alexandria Okon is a runner who is expected to perform well. “She is the ECC pre-season athlete of the year, the favorite in the 500-meter, where she is the defending league champion and the meet record holder and she is the favorite in the 800-meter, where she has the best time of the year,” Buckley said. What distance she will be running at the ECC Championships is not decided. “She can’t run both. They are too close together,” Buckley said. Okon was not present during practice on Feb. 8 due to a visit to LIU Brooklyn, where she most likely will be running next year. Both the men’s and the women’s team have many other runners who Coach Buckley sees as potentially scorers. He mentioned, among others, Margaret McKeever, who will compete in the 1000-meter dash, Nicolette Agostinacchio and Nataly Ramirez in the 500-or 400-meter dash, Jacqueline Ginty in the 60-meter dash, and Jeffrey Reyes in the 1000-meter dash, where he is the meet record holder. This East Coast Conference Championship will be Coach Buckley’s last as head coach for the LIU Post track teams, due to the merger. When the announcement of the merger reached him, he decided to not be a part of it. The head coach for LIU Brooklyn, Simon Hodnett, will be responsible for the track teams next year. In his 45 years as a coach, Buckley has spent the last three as head coach at LIU Post. “I have enjoyed my time here but now it’s time to stay home and read a book all day or find something else. We will see what happens but it was a good run,” he said. The East Coast Championship will take place on Saturday, Feb. 16 at Ocean Breeze Athletic Complex, Staten Island.